Summary: Paul Komyatti, Sr. on occasion drank to excess and became loud and violent. He was disliked by members of his immediate family, which included his wife, Rosemary, his son Paul Jr., and his daughter , Mariann. Paul Sr. had demanded that Mariann divorce Vandiver because of his criminal past., and threatened to inform the police on him. 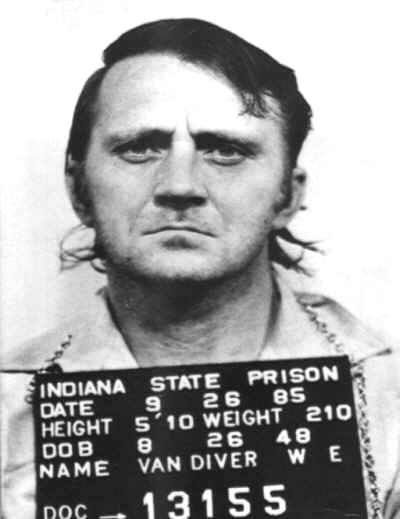 Vandiver joined with the family in a conspiracy to kill Paul Sr. Pursuant to their agreement, several attempts to poison him were made without success. Finally, they decided to put him under with ether and inject air into his veins. One evening, Vandiver and Mariann waited outside the home for a signal from Paul Jr. that Paul Sr. was asleep. Upon seeing the signal, they entered the house and changed the plan at the last moment for lack of ether. Instead they entered the bedroom intending to smother Paul Sr., and sprang on him in his bed. Paul Sr. fought hard for his life and yet another attempt at murder was bungled. Vandiver, however, terminated the resistance by stabbing him in the back with a fish filet knife "at least 100 times." 34 deep knife wounds were later discovered on the body. He hit him in the head 5 or 6 times with his gun, but he was still breathing. By Vandiver's own admission, decapitation was the immediate cause of death. Vandiver and the other family members then sectioned up the body while making jokes. Evidence was also presented that Vandiver had gotten a "loan" of $5000 from Paul Jr., as well as $1700 and Paul Sr.'s truck from Rosemary. At trial, Vandiver recanted his prior confessions and placed the entire blame on Paul Jr. for the murder and dissection. Trial:	Indictment for Murder filed (06-24-83); Amended Indictment for DP filed (06-30-83); Notice of Insanity Defense filed (07-29-83); Motion to Change Venue (08-08-83); Motion for Change of Judge (11-04-83); Insanity Plea Withdrawn (12-05-83); Voir Dire (12-12-83, 12-13-83, 12-14-83); Jury Trial (12-14-83, 12-15-83, 12-16-8312-16-83, 12-17-83, 12-18-83, 12-19-83); Habitual Offender filed (12-19-83); Verdict (12-19-83); DP Trial (12-19-83, 12-20-83); Verdict (12-21-83); Court Sentencing (01-20-84). Habitual Offender Dismissed (04-13-84).